Our first stop: The World War Two Memorial. Though the Korean War Memorial gave it a close run for it’s money, the WWII Memorial will always be my favorite memorial because of it’s history, the significance, and the memories which we have there. Mr. Virden and Mr. Covill had never visited it before, and I think they enjoyed every minute of it, despite the fiercely cold blasts of wind that seemed to appear just for us. We arrived early enough that morning to escape some of the crowds, but not before a school field trip surrounded some of our fellas, shaking hands, taking pictures, and thanking them. Jubilee and I took Mr. Covill to some of the places on the walls where it marked the locations he had served, the main one being Tinian Island. Though little known today, Tinian Island holds a significant part in WWII that changed the entire course of history. Mr. Covill, after gallivanting all over the world as an electrical engineer for the Air Force, would end up spending one year on Tinian, during which the war came to an end. Mr. Covill pointing to Tinian Island, where he was stationed for 1 year during the war. When the Enola Gay was on Tinian to be loaded with her precious cargo, Little Boy, the first Atomic bomb, he said, “I didn’t help load it, but I watched it and they had to open both bombay doors it was so large.” He laughed when I asked him if it was hard to sleep knowing such a bomb was just next door. “Of course not because we had no idea what it was!” But I bet it made the hair stand up on his neck when he learned about it afterwords. While we were at the memorial, Mr. Jeff Miller, the cofounder of the Honor Flight program came out and spoke with our veterans. It was a beautiful thing to see him talking with the vets. Over the years since Honor Flight first came about in 2004, Mr. Miller has seen his vision grow as thousands and thousands of WWII Veterans have taken trips to the WWII Memorial, making dreams come true and showing honor to a generation of men set apart from all others. It meant a lot to all of the veterans that he came out to speak with them personally, and many were in tears as they thanked him for his vision to see our veterans honored. It should be noted that one of the mottos of the trip was, “If you aren’t on the bus on time, you might find yourself on a bus with hoards of teenagers and school kids.” So after our allotted time, we hustled to the bus to head to the next stop: the Vietnam and Korean War memorials. These are stories in themselves. But since I am trying to stick to Mr. Covill and Mr. Virden right now, we’ll have to come back later. The Air Force Memorial was definitely one of the most memorable parts of the trip. We’d never been before, and though it is a magnificent piece of architecture, what made it so special was that it was dedicated to men like Mr. Virden and Mr. Covill, our flyboys. Wheelchairs were pretty much required considering the length of the day, so to keep Mr. Virden and Mr. Covill on their toes, every once in a while we’d swap out “wheelchair duty” and see how long it would take for them to notice. I took Mr. Virden and pushed him around, admiring the height of the memorial, chatting here and there about the Air Force, etc. Up to this point, when we had asked Mr. Virden where he had served during the war, he was quite insistent that he'd stayed stateside flying transports. As the day went on, we managed to pull a little more out of him, learning that he had indeed flown transports, not just stateside, but to the Pacific regions too. This was something. What did he carry? We had to ask, of course. The answer: everything. Paratroopers on their training jumps, equipment, cannons, even live monkeys. After the war he stayed in for a total of 21 years, making a career of it. As I pushed his wheelchair, he asked to get a closer look at one of the memorial walls. As he read it -a list of Air Force Combat and Expeditionary Operations during the Korean war- he bit his lip and said, "I flew those three up there." It was obvious there was more to it than just flying, so I asked him what he was transporting. "Supplies and ammunition in... and severely wounded out..." I learned then that every single day from June 1950 to January 1951, Mr. Virden would make the trip from Japan to Korea. Supplies in, wounded out. Every. Single. Day. Mr. Virden never got near enough to the combat to experience it, though the sounds of battle were loud and clear, but he saw plenty of it in the faces and damaged bodies of the American boys he carried out. An almost never ending number that must have seemed hopeless at times because he never knew how many of them, some too young to shave, would survive. Though this conversation at the Air Force Memorial was in reality only a moment, it drove deeper the somber reality that war is a terrible, terrible thing, and you don't always have to be in the middle of the action to get a front row seat to its horror. Following the Air Force Memorial, we stopped briefly at the Iwo Jima Memorial - no doubt, one of the most beautiful monuments in D.C., a masterpiece of work and an unceasing reminder of American freedom. The climax of the Honor Flight for most of the veterans was the Changing of the Guard at Arlington National Cemetery. This has been often talked and written about, and most people make a point to visit it, so I won’t go into the details here. Suffice it to say, it is a remarkable and moving event to watch, only made more so by the fact that we were surrounded by veterans, not just of our Honor Flight, but two other Honor Flights, equaling nearly 200 veterans. Just beautiful! The last stop was a new memorial, the American Veterans Disabled for Life Memorial. This meant a lot to some of the fellows who have been carrying their injuries, internally and externally, for their entire life. Speaking to one of the veterans at this memorial, we learned that his son was the first U.S. casualty in Afghanistan. He was coming on this honor flight, not just for himself, but in memory of his beloved son. But as all good things, even the best, must come to an end...or at least take a pause, our wonderful trip was drawing to a close. After a delightful tour of D.C. (in which -as Mr. Virden pointed out- we must have passed the Pentagon a dozen times), we traveled back to the airport for our return journey. Though ready to get home, I think we were all a bit somber at the thought of leaving our new dear friends. At the beginning of this brief trip to D.C., we were all strangers, gathered together from various parts of Austin and the surrounding cities. But by the time we arrived home (as cliche as it sounds), it truly felt like we were all family -the entire group. Dinner, a water cannon salute, the delightful plane ride home chatting with a few of the veterans about our favorite radio shows from the 40s and 50s, another water cannon salute in Austin, and then the de-boarding - We were almost home, but not yet. There was one more surprise waiting for the veterans of Austin Honor Flight #30. After everyone was off the plane, we lined up again and proceeded out of the terminal (by now pretty empty because of the hour). Waiting at the end of the terminal, by the front doors, was a crowd of family and friends ready to welcome these heroes home. Upon seeing the crowd a split second before they all bellowed out "Welcome Home," two or three of the Vietnam veterans walking behind us declared, "Oh no! Not again!" But their grinning faces said otherwise. "Squadron 95." A little tired and bleary-eyed, but very happy. Our last photo together before saying goodbye. Whoever said, “It takes an army to move an army,” was not exaggerating. 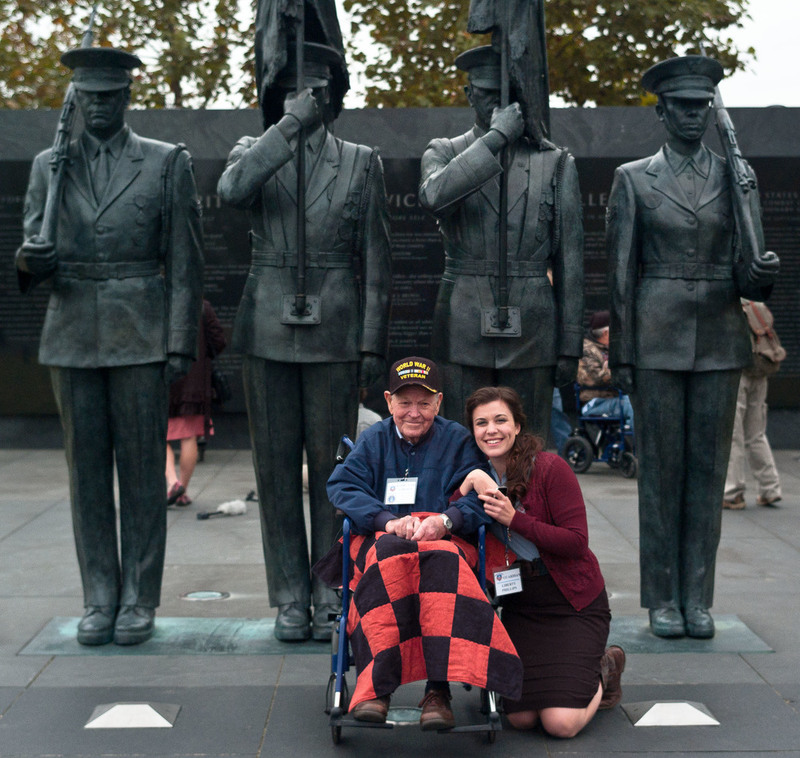 The team from Austin Honor Flight (as always), gave a magnificent weekend to the veterans of WWII, Korea, and Vietnam. The work they put into every detail was tremendous, but worth every bit to see the faces of the men they were honoring. It was a long-time dream come true for Jubilee, Faith, and me to be Honor Flight Guardians, and we are so grateful for the opportunity that Austin Honor Flight gave us to participate in this special event. 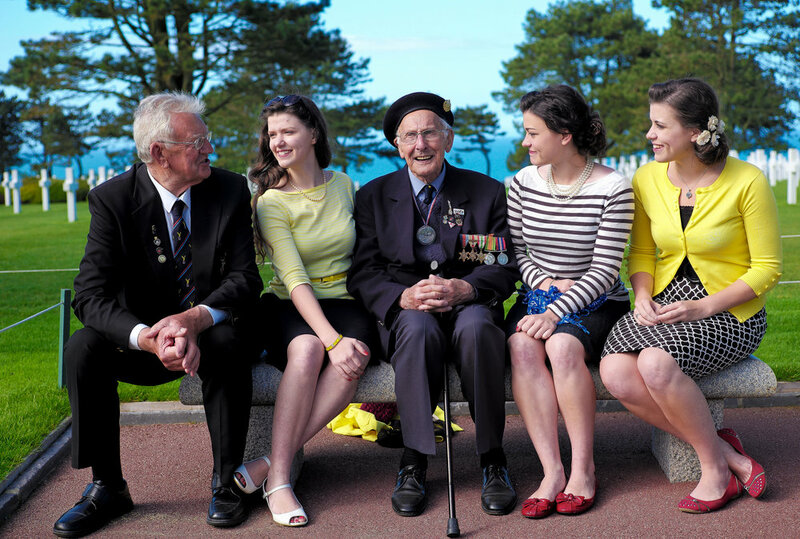 As we have said a hundred times (and will say another hundred), the experience of escorting these dear veterans to their memorials, and for the first time, is truly unlike any other. The friendships we made will hopefully continue on past the Honor Flight, and the memories will last forever. One warning however: Once you've got the Honor Flight bug, it is impossible to get out of your system. Thus ends the story of "The Three Musketeers, Squadron 95, and their grand little adventure in D.C."
Post script: The name the, "Three Musketeers" came from Mr. Virden. Despite growing up in a family with six sisters, we quite dumbfounded him at times by our antics, thus he bequeathed us this charming name.